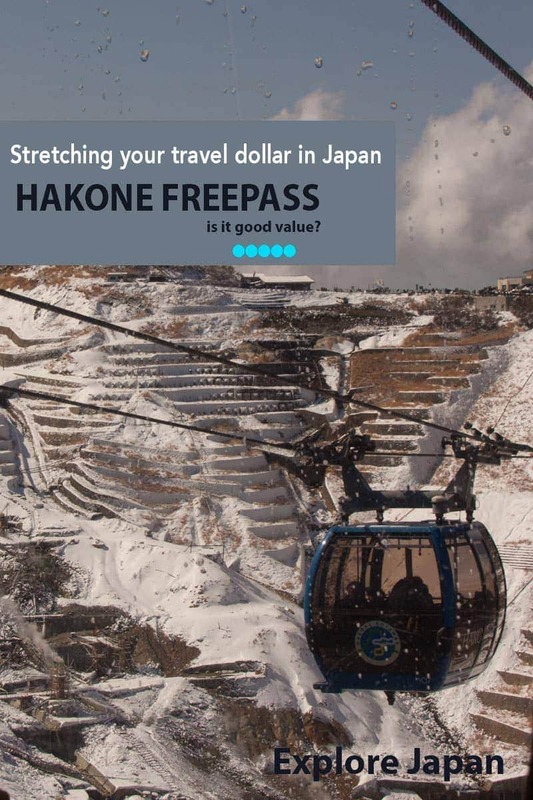 Hakone Freepass | Is it good value? Hakone is a popular day-trip from Tokyo or an interesting short stay option. For visitors who want an onsen experience while in Japan but don’t have the time to travel further afield it’s easily accessible in Hakone and there’s so much more to see and do in the area. In an earlier post we looked at a day trip itinerary for Hakone out of Tokyo taking in several of the highlights including the gorgeous views, cable cars, rope ways, the geothermal area at Owakudani, a cruise on the beautiful Lake Ashi and some glimpses into the areas history dating back to the Edo period. I recently reviewed the value we received from the Osaka Amazing pass and based on feedback from that one I thought it would be helpful to take a closer look at some of the other passes we’ve used during our travels in Japan. We don’t regularly buy city passes, often they’re not suited to our slower pace or the way we travel. We like to throw in detours as we go and adjust plans when something takes our interest along the way. We’re also quite selective about what we want to see and do with our limited time, we won’t go to something just because it’s a free inclusion on a pass. Is the Hakone FreePass good value? The Hakone Free pass includes all Odakyu-affiliated transport within the Hakone region. 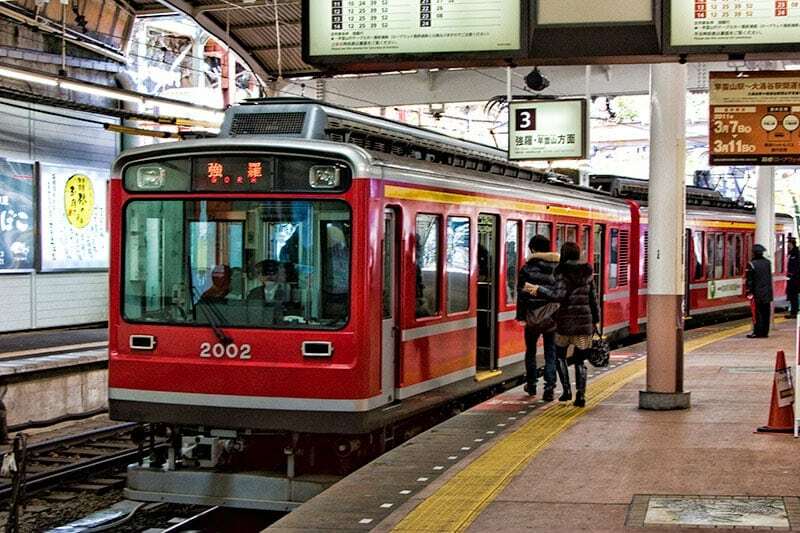 It covers 8 forms of transport including trains, buses, cable car, cableway and boat that is sufficient to get you around all the major sights of the region including to the Gotemba Outlet Mall. You also get discounts to a number of attractions including museums, gardens, hot springs, shopping and dining establishments. A few attractions such as the Gora Park Botanic Gardens have free entry with the pass. Just watch for the stickers on the doors or booking windows to show whether they participate if you aren’t sure. If you are already in Hakone, have an active JR Pass, or find it more convenient and cost effective to travel direct from another city or part of Tokyo you might choose as we did to purchase the Hakone only pass. If you choose the ticket including the Shinjuku return version you need to be aware that this now includes either the Hakone Highway Bus which takes around 2.5 hours or the normal fare portion of the Romance-car limited express train from Shinjuku. If you select this option you will also pay a surcharge (currently Y890) which is the Limited Express Surcharge and seat fee for the train which reduces the trip down to around 85 minutes. You can view more information on the discounted attractions at the Hakone FreePass Official site. Tickets can be purchased from ticket machines or counters at Shinjuku station or arrival stations such as Odawara, the Shinkansen station in the Hakone area. A new option is that you can now purchase the pass online before you travel. 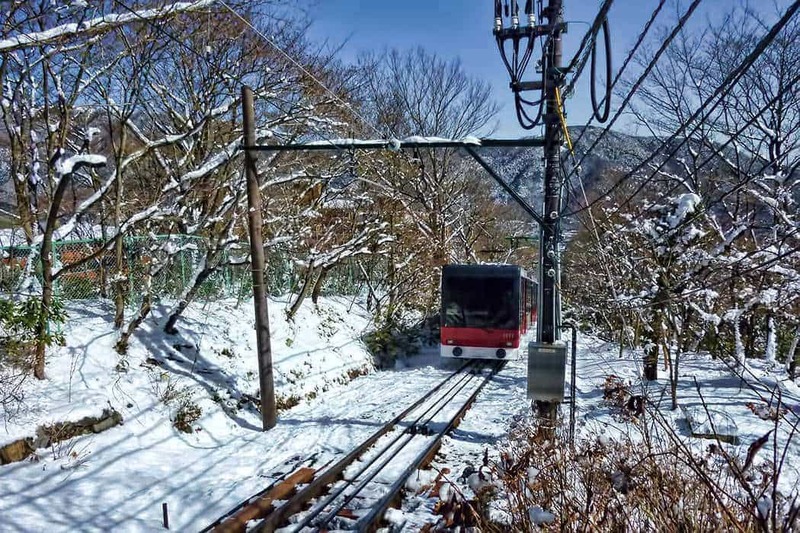 The transport within the Hakone region covered by the FreePass can all be used as many times as you want within the period covered by the pass. While most people complete the course as a loop you can change direction and repeat sections if you want to within the same day or on consecutive days. This might be useful if you want to complete the course and go back to a section if you have time at the end of the day, or where you are using it across multiple days. Although we were only taking a day trip we purchased the minimum 2 day pass at Odawara Station for Y4,000 (around A$45). The reason we started at Odawara not Tokyo was that we already had an actived JR Pass covering the period. The JR pass lets you use the Shinkansen at no incremental cost, so it’s both faster and offered more choices on when we started and ended our day. The Shinkansen takes 35 minutes from Tokyo station, the Odakyu Romance-car takes 85 minutes from Shinjuku station which was further away from where we were staying. This leg takes about an hour travelling on the Hakone Tozan Railway. You catch the Tozan train from the same Odawara station building that you arrive into from Tokyo. We sat on the left hand side of the train and got some amazing views out of the big picture windows. During winter the mountain was covered in pure white powder snow, other seasons would be equally pretty though and we’re considering returning with a different itinerary for an autumn foliage visit. If you want to go to the Hakone Open Air Museum get off at Chokoku no Mori station (one stop before Gora) and it’s an easy walk from there. Cost without the Hakone FreePass would be Y670. It’s a very short walk from the Gora Tozan train station to the cable car station. If you were going to walk from there it’s a very steep slope especially in the winters snow but the cable car makes the 1.2km track a breeze in around 10 minutes. Make sure you position yourself to enjoy the view, it’s beautiful. The cable car takes you to the boarding area for the first section of the rope way. There are 3 sections on the rope-way so it is a decent length ride to take a good look at the natural area and geothermal landscapes around and under you. The first section is Sounsan to Owakudani, then Owakudani to Ubako and finally Ubako to Togendai station. Take some time at Owakudani to have a good look around. The views of Mt Fuji if you have a clear day are absolutely stunning from here. If you walk up to the geothermal area you can see where they cook the black eggs. There are large steaming vents in the mountain and pools of almost boiling water. There’s a restaurant for lunch at the top and you can buy the black eggs said to give 7 years of good luck. From the last ropeway station at Togendai walk down to the edge of the lake. We spent a while walking around a park area on the lakes edge waiting for the next sailing time. We weren’t sure on the relevance of the pirate ship on the lake but then the 1970’s swan paddle boats were a bit of a mystery too. The views from out on the lake were excellent, you could see Mt Fuji and the Hakone Shrines floating torii towards the other end of the crossing. During winter the hillside was quite bare and brown, at other times of the year you would expect to see it covered in blossom, coloured autumn leaves or greenery. We only used the bus to get back from Lake Ashi to Odawara station but there’s an extensive bus network if you’re staying in the area or want to visit attractions further out. The bus isn’t our preferred transport in Japan, the seats are quite small, you board in the back door and they run on time so there is little patience if you’re a bit slow finding the right money. Another reason why I like to have either a day pass or a stored value card for the transport. The FreePass included value for the route we took is Y4420 for a purchase price of Y4000. We did the course we planned to do and saved Y420 or 9.5%. So we did find the pass worth while? While the financial saving was minimal for a day trip it was very easy to purchase the Freepass at Odawara station and it meant we didn’t need to queue for tickets or find the right change throughout the day. If collecting a pass from the Odawara Station Information Centre isn’t convenient there are also dispensing ticket machines at Odakyu stations along the line. In hindsight we didn’t feel the pass was a necessity for the day trip but there was no downside, it was convenient and offered a small cost saving. 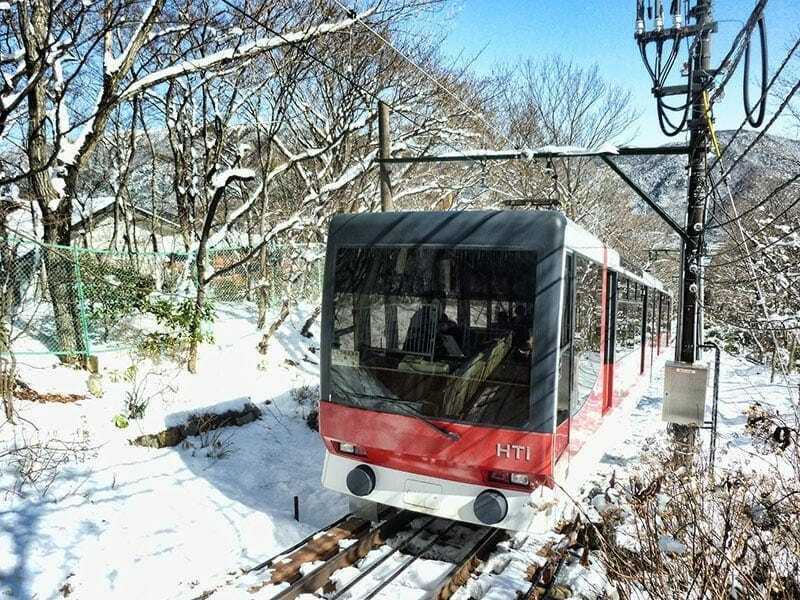 The cost saving would be better for anyone either using the full round trip from Tokyo or staying in Hakone overnight and continuing their sightseeing on the second day. If you want to know more about what there is to see and do in Hakone, or if you’re interested in some addtional information and tips for planning your trip you may also want to read our article on A Day Trip to Hakone. If you’ve visited Hakone either using the freepass or without, we’d love to hear your thoughts in the comments below. Hi, your contents are really helpful for family travellers like me. Hope you are able to help as I was not able to find the info – when they say 1/2/3 Days Hakone Pass, how do they time the validity? From the time you got the tickets or by the midnight? We are arriving into Hakone after 1pm and an overnight so we are unsure if we could complete the route on one day or need 2 days pass. We are heading to Osaka thereafter. Thanks in advance! Hi Laura, the passes work on a calendar day basis, the main route is comfortable to do in a single day but it does take most of a day if you are not going to be very rushed. There are 2 passes (2 or 3 days) so even for a day trip the pass you get is actually valid for 2 days so you won’t lose anything doing it that way. Hi, Is the Hakone Free Pass available for purchase at Hakone-Yumoto Station please? Hi Camilla, there’s a Tourist Information Centre at the station and you will be able to buy it there or at the ticket machine. The machines have a button for English and then there is a tab to pick Free Pass and make your selection from there. Have fun. I have a question about Hakone transportation and the Hakone Free Pass. I would like to make a day trip to Hakone from Tokyo Station via Odawara on the Shinkansen and return on the Romance Car. Is this possible? I will be getting the Hakone Free Pass as well but should I get the pass at Shinjuku to get the round trip or should I get the pass at Odawara. Which is the better value? If you are only going one way in the Romance car it’s better value to get the pass just for the Hakone region. It’s easy to buy it either from the office or machine when you arrive in Odawara. Then buy an individual ticket for the train back. Hi guys! Another interesting post. My sister and I are spending our last weekend in Japan in Hakone and want to know if we will get value out of the Hakone free pass. We will be coming from Kyoto and have active JR passes for this journey, however our JR pass will expire while we are in Hakone and therefore will not cover our return trip to Shinjuku. Is there a way to get a one way trip back to Shinjuku with the Hakone pass or will it be best to simply purchase the hakone only pass and pay for our journey back separately? And if so, what do you believe the best option for that trip will be! Thanks in advance! Hi Kaity, if you’re only using the pass one way to Tokyo then it’s more economical to buy the pass within the Hakone region and the return train ticket separately. Depending on where you are headed in Tokyo either the Odakyu Romance car to Shinjuku or JR will work. Going to Tokyo in March next year and planning a trip to Hakone. I was on the Odakyu Line website for well over an hour and still wasn’t sure as to the most economical discounted pass to take. Was originally planning to stay 3 nights and trying to weigh the pros and cons of the 3 day Hakone Free Pass with or without the return trips from Shinjuku. But I’ve learned so much from this article and even more after reading the comments section. We might just opt for staying 2 nights instead of 3 to save my brain from frying further and also since you mentioned that accomodation in the area is expensive. So staying one night in a hostel and the second in a ryokan. So excited for this and the onsen experience. This will be our 2nd trip to Japan and I can relate to how you say you guys like to travel slow and not sticking to a rigid itinerary. Thanks for leaving a message Virginia. It can be a bit time consuming doing the research but the Hakone onsen are amazing and the whole area is beautiful – I think you will find your time there well worth the planning. Have fun. thanks for the post. We need your advise. we’re planning to visit Hakone from Tokyo and staying for 3 days and 2 nights. At the end of our trip, we are planning to go Gotemba Outlet. What’s the most cost effective way using Romance Express for the trip? Does the above include a return ticket to Shinjuku? or just one way? The Hakone Free Pass tickets purchased with the Tokyo (Shinjuku) connection include the base ticket for the return train trip, if you aren’t planning to use that then the pass purchased within the Hakone zone would be more cost effective so you aren’t paying for something you won’t use. This leaves you free to use another train company or mode of transport to get there and back. Have fun! Hi! Again another great post, thanks! If we don’t have the JR pass, would it be best to buy the Hakone Free Pass only once in Hakone area or is it easy/cheap to get to Shinjuku if not staying around that area. We have no idea yet about where we are staying but hopefully soon! It can depend where you are are staying Miia, we have now done 4 different options, the JR pass on the bullet train, JR local trains, the green car in JR local trains and the Hakone Free Pass. If I was staying fairly close to Shinjuku the Romance car is a comfortable way to travel the distance compared to the JR local train especially if you are heading out early in the day when they can be very crowed with the work and school commute. When we were staying out at Shiodome the JR direct train goes through the station nearest the hotel we were staying at so it was far more convenient than getting out to Shinjuku first so we used that. On the way back we upgraded to the green car, I think it was around a $10 supplement and well worth it at the end of a fabulous but very full day. It doesn’t need to factor in to where you stay, there are good options from different places but I’d choose how you get there once you have decided on your accommodation. Hi, I stumbled onto your blog and it has been a great read. Planning a trip to Japan is so overwhelming! I am staying in Kyoto then heading to Hakone to stay overnight in ryokan before heading back to Tokyo. Keen to see the outdoor museum – should I get a Hakone pass? I will have activated my JR pass already. Hi Emma, if you’re only going to the the Open Air Museum you won’t need the pass, individual tickets or stored value card such as PASMO or SUICA will be much cheaper. The pass is great value if you want to do the circuit including the rope-way and trip on the lake. Is your ryokan along the Tozan train line somewhere too? Thank you so much for the reply it’s my first time visiting Japan so I am incredibly nervous to get this right lol. I am staying at Ichinoyu Shinkan on the Tonosawa line. I will have a suica card too. I think Ichinoyu Shinkan would only be a 2 minute walk from Hakone Yuryo Onsen that we visited in autumn last year – I would love to hear what you think of it as the location is very convenient with the shuttle bus down to Hakone-Yumoto where there are restaurants and and you can walk out to the shrine and waterfall temple from there. It sounds like a fabulous first trip, it’s an easy country to fall in love with. I did choose it because it seems like I don’t have to change transportation a bunch of times as well as having a private onsen in the room (tattoos). I will let you know what it’s like! – I’m staying in early November. So you can use a Suica card in Hakone? You can use the Suica (or other IC cards) in Hakone. You don’t need it if you have the Hakone Freepass but we’ve used it when we aren’t doing the full circuit. We are going to Japan in late sept/Oct for 13 days. First 4 days in Tokyo and taking tour bus to Hakone-stay overnight and then to Kyoto and back to Tokyo. activating Rail pass in Hakone for our trip to Kyoto-hiroshima-tokyo. -Rail pass can i use from Hakone-Kyoto and then side trip to osaka-back to Kyoto then Hiroshima and Tokyo? -also can we stop at Nagoya as planning on going to Toyota museum -will Rail Pass work? should we have to stay overnight?-then we need Nagoya to Kyoto- will Rail pass work? Hi Ganesh, the Japan Rail pass will work for all those routes, either stopping overnight or leaving your luggage in a locker at the station while you visit on a stop over. The only restriction is that the travel all takes place within 7 consecutive days, or the length of the pass purchased, and that you are using Japan Rail trains which are available for all of the destinations you mention. The Hakone Free Pass should work well for you if you plan to do the circuit or travel through a good portion of it as you’ll be able to use it on both days. Thanks Toni for your prompt reply. Hakone – what do you mean by the circuit for Freepass-is it the other areas around Hakone? also what is best place to buy Railpass? The Hakone Amazing Pass is mostly a transport pass so it’s worthwhile if you are going to go around the Hakone sights on the Tozan train, cable car, rope way and boat etc. For the rail pass I buy them online from Japan Rail Pass, an official online vendor which I’ve found reliable and a good price but there are a number of online sellers and also high street travel agents that sell them. How long does it takes for u to complete ur day trip in Hakone? Does the Hakone freepass only start from hakone yumoto station, can I catch the tozan railway from odarawa station to start my journey? Hi Shin, the Hakone pass covers the whole Hakone area so it does cover the railway from Odawara. You can also get a version of the pass that covers the trip from Tokyo if you are wanting to leave from Shinjuku. It does depend how fast you travel, we tend to be slower travellers, but I would allow most of the day to complete the course especially if you want to do any additional parts along the way like the Open Air Museum, a visit to an onsen or exploring Hakone-Yamote and Hakone Shrine. We only have one day to spend in Hakone and we are going there next week. Does this above one day itinerary cover off going to the Shrine (the walkway with all the red lights along the side)? I couldn’t see it mentioned anywhere? we will be travelling to Hakone from Tokyo and we are not buying a JR Pass so how do you recommend we do this best? Hi Samantha, we’ve been to a couple of shrines in Hakone but the photo that’s often seen with the red lanterns I think will be Hakone Shrine. On this itinerary after the cruise across the lake you have 2 points you can get off. MotoHakone-ko is usually the second stop and closest to the shrine, it’s maybe a 10 minute walk. If you get off at Hakonemachi-ko you will be able to visit the Hakone Checkpoint museum and just past there is an avenue of cedar trees which is part of the old Tokaido road. Follow around the lake front and it’s about half an hour on foot to the shrine. You could get the bus closer but they are infrequent so would probably take longer that way, also your pass allows you to use the cruise as much as you want so you could get to the shrine that way but do check it is going to Motohakone-ko as the first stop or it could be a long trip. You may also spot the red torii gate at the lakes edge towards the end of your cruise. How I would get to the Hakone area without the JR pass depends on where in Tokyo we are staying. You can get the Hakone free pass and pay the supplement from Shinjuku if that is convenient to your hotel or last year we just used the JR Tokaido line to Odawara, it cost Y1490 ($15) then you can purchase the Hakone Freepass for the Hakone region. I am thinking of going from Tokyo to Hokone for a day and night stay on June 6 and move on to Kawaguchiko the next morning for a day trip, then go back to Tokyo in the evening. 1) I would like to get your advise if I should buy a 2 day Fuji Hakone pass instead of a 2 day Hakone free pass? 2) Is is correct that I can take a bus from Togendai station to Kawaguchiko? 3) From Kawaguchiko, what is the best way to get back to Tokyo? Any suggestion? Any advise provided would be appreciated. Hi Mavis, I’ve not used the Fuji Hakone pass option but it looks like you can use the Odakyu Hakone Highway bus to Gotemba then the Fujikyu bus to Kawaguchiko. If you used the Romance car to Hakone then the only included option back to Tokyo is the highway bus to Shinjuku which needs to be pre-booked – http://bus-en.fujikyu.co.jp/highway/detail/id/32. Thanks for your reply Toni. As my trip is still not finalize, would it be safe if I don’t do a pre-booking now? When I buy the ticket for the Romance car at Shinjuku the day before, can I do a booking there and then? I am travelling on a weekday, Thursday to be exact. Hopefully it is not crowded going back to Shinjuku from Kawaguchiko. Generally mid week is going to be less in demand than weekends but it will depend on the season and other factors. Sorry but I don’t have enough knowledge of the Kawaguchiko pass and route to know for sure. I will figure out when I am there. Thanks anyway, Toni. We are staying in Asakusa. We have the JR EAST PASS (Nagano, Niigata area) . Can we use this pass to get to Odawa to purchase a Hakone Pass??? Hi Deion, neither of the JR East passes cover Odawara in the Hakone region. Of the current passes from Tokyo only the full JR pass covers it. Another option is to get the Hakone free pass from Shinjuku in Tokyo, when we were in Hakone again in December we had a chance to have a good look at the Romance car (the train they use from Shinjuku) and it looked very nice and comfortable. If I arrive in Shinjuku on say 18 Apr, then will go to Hakone on 19 Apr, should I buy Hakone freepass at Shinjuku station on 18 apr? as I go in a group of 8 people and plan to take the earliest train on 19Apr. What time the train start from Shinjuku to Odawara? Another query, what’s your suggestion to avoid crowded, the way as you did (start from Gora) or the other way (start from Lake Ashi)? It can certainly be pretty crowed. We aim to go to those places mid week and not during a holiday and we start as early as possible in the day which puts us a bit ahead of the crowd. Our autumn visit late last year was busier than when we went in winter so I think seasons (sakura and fall leaves) make a difference. Although I don’t think it is quite so simple, if we did the full circuit again I would probably reverse it, head out and do the Checkpoint, shrine and boat trip first and then continue on. This would involve starting with a bus trip rather than changing platform to catch a train but because this breaks the flow a bit people tend to do it the other way so you could benefit from catching the transport going the other way. Hi Ika, you can pretty much leave as early as you want. The first train of the day I found leaves at 5.31 am getting to Odawara just before 7 am. Here is the Hyperdia schedule for that route http://www.hyperdia.com/en/cgi/en/intervaltime.html?dep_node=SHINJUKU(JR)&arv_node=ODAWARA&search_target=intervaltime&diagram=63808&year=2017&month=11&day=28&searchday=20171128. There are other schedules so I would suggest using Hyperdia and selecting Shinjuku (JR) and Odawara to find what suits you best. You can buy the tickets from the Odakyu vending machine, the English button is in the top right of the screen and you need both the Freepass ticket and the limited express supplement ticket if you want to get the train from Shinjuku. Limited express trains require a ticket and limited express supplement but the Freepass covers the base ticket so you only want to buy the supplement. The machines are quick and there is rarely much of a queue. You can advance purchase but in that case I’d buy it at the info counter instead and make it clear when you plan to use it. Thanks for your advice and sharing your experiences for Hakone. I am going in July and am wondering whether to stay 2 nights or 3 nights. I want to get the 3 day Free Pass. Do you know if the pass is considered a 72 hour use, so if I arrive on day 1 (depart from Shinjuku) in the morning and stay day 2, stay day 3 and leave day 4 in the morning, does that qualify/fit in the 3 day pass parameters, or does it just counts # days, so really meaning 3 days and 2 nights, regardless of the time you arrive or depart Hakone? Thanks for your help. Just trying to figure out how many nights accommodation I would need to book for a 3 day Free Pass. Hi Angie, the pass is for the calendar day not a 24 hour period. As accommodation is relatively expensive in the Hakone region most people find 2 nights (3 day pass) will be enough to enjoy the sights, soak in the onsen and relax especially if you don’t need to rush off to your next destination on that last day. Hi, thank you for the very informative post. I am going to Japan this December (winter period), and thinking of visiting Hakone (2d1n). We will be going to Hakone from Tokyo, and then continue our trip to Tokyo. We have purchased the JRpass as well. Based on your post, we should be taking the Shinkansen train from Tokyo to Odawara, and then buy the Hakone Free Pass? Can the Hakone Free pass be used at Odawara- How to go to Hakone from Odawara? Also, do you have any Ryokan to recommend at Hakone? Thank you so much! Hi Rachel, the whole area is referred to as Hakone, which part in particular at you wanting to get to? For example for the township of Hakone Yumoto where many of the onsen and accommodation are would follow the directions in the article taking the Odakyu train from Odawara station towards Gora but get off at the 4th stop for Hakone Yumoto. We are going to Hakone this June 18 and your information is so useful for us. Do we need to reserve the seat of the train from Odawara to Hakone? Because we would like to sit on the left side as you mentioned to see the beautiful view. Or we could see them from both sides of the trains? Hi Angie, Odawara to Hakone is a local train so you can’t reserve a seat. The 18th is a Monday I believe so it will be a little less busy than on the weekend but it is a popular route. You will have a good outlook from either side but having done it a couple of times now we just like the left a little better 🙂 Enjoy! Thanks for the detailed blog, very informative. I will be buying a JR pass and plan to buy the two day Hakone pass. Would it be too tiring for us to be return back to Tokyo and go back again the next day to Hakone for enjoying the onsen and going to the museums? It would depend on your travel style Raji but if you have the JR pass then it would be quite easy to do, it’s only 35 minutes on the shinkansen from Tokyo station and won’t add any extra cost doing it that way, you will actually be getting some good value from both passes. Co-incidentally I’ve just been looking at the day visit onsen options in Hakone today, we are headed back in a few weeks and plan to do a day out of Tokyo with a half day onsen soaking and relaxing and the other half exploring the Open Air Museum we missed last time and a few extra things if we can fit them in. Hi there, your blog is very informative. Certainly worth sharing! I understand that the round trip package of the Hakone Free Pass involves either a bus ride or a train ride from Shinjuku and back. Do you know if the free pass gets activated upon the journey from Shinjuku to Hakone or only when I used it on the local train/cable car/bus rides (Hakone Tozan Railway etc.)? How does it work altogether – do you get separate passes for the transportation in Hakone, and a different one for the RomanceCar to Shinjuku? As I’ll be spending a full day hiking Mount Fuji, I’d hope that I can activate the pass later. The pass is activated when you first use it whether that is Shinjuku or the Hakone region. If you are coming from somewhere other than Shinjuku I’d suggest you buy your Hakone Freepass within the Freepass zone without the Tokyo transfer included. You can buy a pass to use from Shinjuku or just within the Hakone zone so you aren’t paying for a transfer from Shinjuku that you aren’t using. We would like to plan the day trip to Hakone, without using the JR pass what would you suggest be the best way to go? I do want to buy the Hakone freepass as well. Any help is greatly appreciated. Thank you so much ! Hi Dori-Ann, happy to give my suggestions, can you tell me where you will be departing from? Hi! Thank you so much for your response 🙂 You are so sweet to help. I am right beside the Tamieke Sanno station but the Roppongi Itchome station is pretty close by too. Hi Dori-Ann. As you aren’t using a JR pass I am guessing you would prefer to avoid the cost of the bullet train option. The slightly lower cost option at (Y1550) would be to use the subway from Tameike-Sanno (ginza line) to Asakasa-mitsuke then transfer to the Marunuchi line through to Shinjuku (~12 minutes) and buy the Hakone pass from there. The pass is an extra Y490 from Shinjuku over buying the Hakone region only pass when you get to Odawara plus you’d pay the limited express surcharge of Y890 and Y170 for the subway section. The train from Shinjuku takes 85 minutes. If you do this option just make sure you buy both the Hakone Free Pass and the limited express surcharge for the Romance car before you board or there will be an extra fee onboard and you won’t have a reserved seat. The slightly faster and simpler option (at Y1660) is to take the subway from Tameike-Sanno to Shimbashi (3 minutes) switch to the JR line and take the JR Tokaido line to Odawara (~80 minutes) then purchase the Hakone pass there either from the office or the machine (English available). Total time will vary a little depending on time of day and how long your transfer at Shimbashi takes. Your post about Hakone trip makes me feel more excited to visit Hakone. However, my budget is quite a challenge. At first I decided to cancel my trip to Hakone but since I found your blog and friends are recommending this place, looks like I need to include this place back in my itinerary. Is my understanding above true? Really appreciate your advice on this. Thank you so much and keep posting! Hi Toni, thank you so much for the very detailed break down cost for the Hakone Free Pass! We are going to depart from Kyoto and stay in Gora for 3 nights, and onward to Tokyo. I think the free pass will definitely be worth it in our case. I can’t wait for October to come! Will the free pass include Romance Car back to Shinjuku? If I understand correctly, train tickets in Japan has a base fare, + extra (was it depending on distance) + reserved seating (optional)? Hi Yng, it looks like they have made a change to the way they are talking about the price on their website. You used to buy a ticket that was either from Shinjuku (return) or within the Freepass region. They’ve now seem to have split it out to talk about the Hakone pass being everything in the region and as it is the Odakyu company you can add-on the Shinjuku return for the reduced cost of just the limited express surcharge. If you are buying it at the Shinjuku end it should still be straightforward, if not they spoke English in the ticket counters and will be able to get you the right one. I think the change is quite new as I can’t find the price breakdown on the site anymore, we are back in a couple of months so will check it out and update the post with the new wording and prices if applicable as soon as I have them. Generally ticket prices in Japan for local trains are simple, on longer distance there is an extra fee for reserved seat (unless you are using JR pass which includes it) and a limited express surcharge on some trains. The limited express is faster as it has less stops and it just seems to be an extra charge for the convenience and based on demand. When you buy the ticket it’s clear on the ticket machine that you need to add it on, we normally use a JR pass which includes it so it isn’t an issue but have used it on the Limited Express from Kansai Airport. Prices shown in Hyperdia include it in the summary under the seat fee from memory. There are also sometime’s extra cost for special seating such as green car on the shinkansen or there is a viewing deck on the Romancecar that is extra. Thank you for your reply! Through many online searches, I found that if the free pass is purchase in Odawara (because we’ll be coming from Kyoto), it won’t include the ride to Shinjuku. Which is ok, I think the price of (3 days) Shinjuku round trip Hakone Freepass with Romance Car (5460 +890 yen) versus Odawara only pass (4500 yen) + 1 way to Shinjuku Romance Car (2080 yen) are almost the same. Phew, my brain can’t comprehend all these details, and it’s just the tip of the iceberg for the entire Japan trip. That sounds fabulous – enjoy! Hi Jessie, the cable cars run in they rain (unless it’s a monsoon of course), it’s generally very high winds or volcanic activity that have closed them. As travellers or tourists it’s always a bit disappointing when you run into heavy rain and only have a day or two to experience an area but we were there in mid winter with snow as you can see in the photos and got around very easily on the public transport with the Hakone Freepass and short distances on foot. Hello, Your blog is really a great help. We are planning to visit Hakone early Nov for a day trip Reading thru this really makes me excited.Like what you did Im also getting the 2 day hakone free pass that starts in Odawara so we can try Shikansen in going back to Tokyo .Im not getting JR pass since we will only explore Tokyo, Hakone and Nikko. My concern is if our Hakone free pass will start in Odawara, can we still ride Odakyu Romance Car from Shinjuku to Hakone-Yumoto using the suica cards? Thank you in advance..
Hi Joyce, November will be lovely, I hope you get some great autumn leaves colour. You can use the Suica and other stored value cards for the Odakyu Romance Car, it’s a limited express train though so you just need to get the limited express ticket with a reserved seat when you buy it, you can’t just sit anywhere like you do on a local train. Hey there! Thank you for such an informative article. I didn’t know there was another Hakone Free Pass from Odawara to Hakone as we bought JR pass as well. Hi! Thanks for the post! Would you recommend doing the packages offered by Odakyu or doing it on your own? It really comes down to personal travel style. We travel independently and I enjoy doing our own research of where to go and which places to visit and stay rather than buy the package, in this case doing it ourselves also saves a few dollars to spend elsewhere on the trip. For comparison at the moment I believe the one day trip package costs Y8300 and doing the same thing with the freepass from Shinjuku and including entry to the same spa would be Y6740 or Y6940 depending on your travel day being a weekday or weekend. You still pick up your tickets in Shinjuku station and it’s an unaccompanied package so for us I don’t see an added value for the Y1560 built in admin fee but that’s us, others will prefer the package and be happy to pay to have it pre-planned and know in advance which spa to go to whereas we’d take and look and see which took our fancy on the day. Congratulations – Fantastic information in your blog. I am going to Hakone in Sept and your blog now makes me excited about Hakone. I don’t think JR pass makes sense for us on this trip? 3 days in Shinjuku then cruise 9 days then 1 day Hakone, 2 days Hiroshima and final few days in Kyoto then home from there. I am still trying to work out how to get from Yokohama Port to Hakone. Any suggestions appreciated. I am thinking of sending my luggage from Yokohama to Hiroshima and taking overnight bag to Hakone. Still trying to work out if that is possible at Yokohama. Have you got any experience in this regard? Thx so much ? I agree the JR pass doesn’t work for you on that route. The luggage forwarding can be a great option for a single night stay meaning you only have to deal with an overnight bag and it’s waiting for you at the hotel when you get to your next destination. The bullet train goes through Yokohama on the way to Hakone so that is an option or there are local train options that are slower but less expensive. I’ve priced it out before and it’s not worth going back to Tokyo to buy the pass from there, get the local version once you get to Odawara station. The Tokaido line takes just under an hour and costs around Y1000 from Shin-Yokohama on the bullet train it’s around 15 minutes but costs around Y3200. Thank you very much for this info. It came handy to me as we are planning to visit Hakone in a few days’ time. Hi Janelle, the passes include a round trip to Shinjuku and unlimited use of the other included travel in the Hakone area. The 2 or 3 day options are designed for those staying in the Hakone region overnight then returning to Tokyo. You would need to buy multiple single day tickets if you wanted to make multiple return trips to Shinjuku. My 22 year old daughter and I are visiting Yokohama and want to go use the Hakone Free Pass from there. We are returning to Tokyo after staying the two nights in Odawara. Would it be cheaper to catch a train to Shinjuku from Yokohama and purchase the return Hakone Free Pass for Sinjuku to Odawara return rather then travel directly from Yokhama to Odawara and purchasing the Hakone Free Pass in Odawara? Thank-you! Hi Mike, it won’t be worth the cost or time to start the journey in Tokyo. It will take almost twice as long by the time you catch the train to Shinjuku then through to Odawara from there. There are frequent local trains on the JR Tokaido Line for Odawara that you can catch in Yokohama and it will take under an hour to get there, if you buy the pass when you are there that will be more cost effective. Hi there, I plan to travel from Tokyo to Hakone and stay for 4 nights. I will not be returning to Tokyo after this, I will be travelling on to Tokyo. 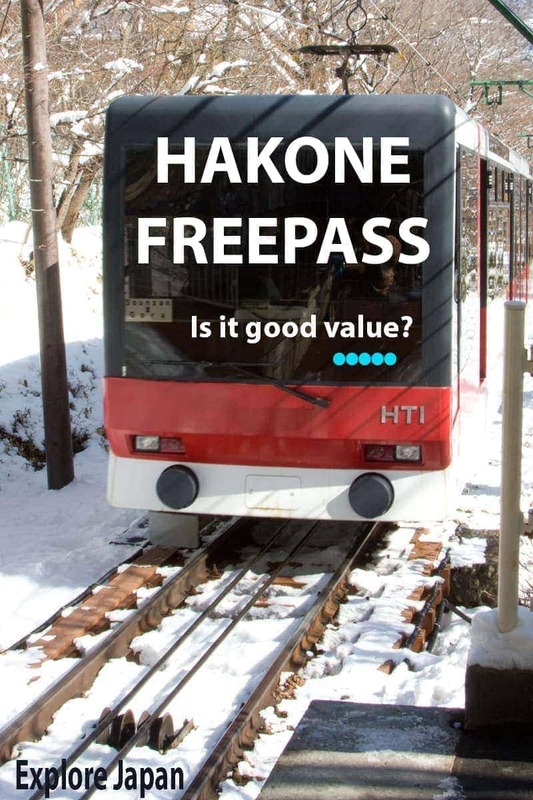 Do you think the Hakone Free Pass is worth it for me? I would obviously not be using the return trip and I guess i would get the 3 days pass as there is no 4 day one? thanks! From what I understand I can use the Hakone Free Pass to get the Romance Car to Hakone and just have to pay a little more on top. sorry, that should say that I am not returing to Tokyo, I am travelling on to KYOTO. sorry! Hi Geraldine, you can get the Hakone Free Pass with or without the Tokyo transfers included. If you buy the one without it is Y1140 less. If taking the train from Shinjuku is convenient to where you are staying I would buy the full pass as it would be most cost effective even if you don’t use the return ticket. Alternatively if you prefer to catch a train from Tokyo station for example and don’t have a JR pass running at that stage which I assume you won’t, you could buy a ticket for the JR Tokaido Line for Y1490 and just get the Hakone Free Pass for use on transport within the Hakone region. Just wants to say thanks for your detailed and most helpful information! We will do the same route in a day and this helped us decide on the free pass. Thanks for the feedback Jen, we hope you enjoy your trip as much as we did! Hi! This entry really provided good insight into travelling around Hakone. I was thinking of doing a day-trip there myself, but am wondering how much time you were able to spend there. Did you think that one day was enough to enjoy the area? Hi Nguyet, from memory we arrived around 8.30am (it’s only 30 minutes on the shinkansen) and left late afternoon as we had something to do in Tokyo that evening, however the trains run much later so we could have fitted in more and stayed for dinner in Hakone had we chosen too. Hi, I would like to ask is it advisable to rent a car from shinjuku & drive up to hakone and stay for a night before heading up to fujiten resort with my kids? Or it’s preferred to pick up the car at odawara ? If I were to drive up from shinjuku, where should I park my car at? 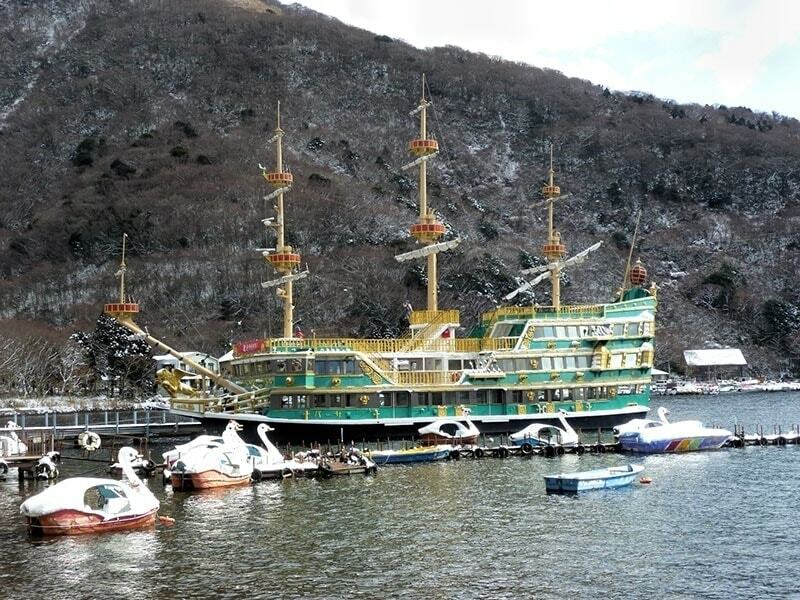 Which hakone sightseeing cruise station ? Togendai-ko? Hi Constance, Sorry I can’t help with this one we only use public transport to get around in Japan and we haven’t driven there at all. For the resort we’d just use the train to Kawaguchiko and a taxi from there. This entry is very informative for Japan tourists. Just a quick question about the Hakone Pass, do they have an option to pre-purchase the pass online? We are here now. The day starts when you buy it/ or decide to start it. So we bought a three day pass which we chose to start straight away, at midday. So we get half this day…done the full circle already and then two more whole days to fatten the experience. Enjoy! Wish I was there at the moment, it is similar timing to our winter trip, do you have snow on the ground? I love the green/yellow boat with snazzy crow’s nests. Or whatever you call ’em. Japan is one place I’d visit in the cold. 1 of the few. I’m such a tropics guy. My wife loved her stay in Hiroshima a while back. 9 months. Dug it. Thanks for sharing the scenery and pass breakdown. We had a three-day pass as we stayed in Hakone for two nights, and we used the transport options extensively to get around, in all directions. One thing to note is that the Ropeway is currently not operating due to volcanic activity…there is a replacement bus that links the lake to the top of cablecar (and vice versa). The whole Owakudani area is totally out-of-bounds which was disappointing, but understandable! Your stay sounded fabulous so it’s definitely possible to enjoy Hakone without the geothermal area access. I’d heard some murmurings about it being about to reopen but they officially responded by reconfirmed the temporary closure again in September. Given volcanic activity is the main attraction of the area between Owakudani and the onsen I guess it’s not surprising that sometimes it will also cause a disturbance. It must be hurting the local economy though with many of the very popular hiking routes also closed, I hope it settles again soon. Japan in Winter is an absolute delight. 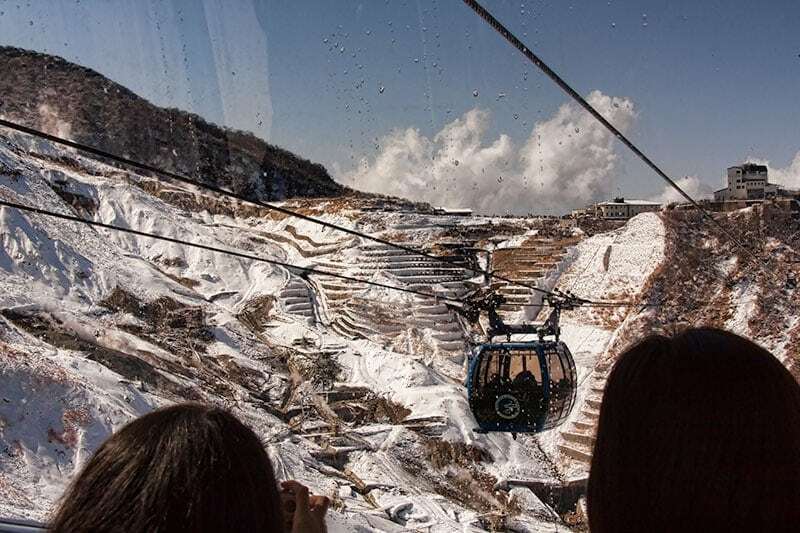 Snow sprinkled over all of the mountains is such a dreamy sight so I love your photo of the ropeway! I never visited Hakone unfortunately as my stay in Japan was a very short two weeks (it simply wasn’t long enough!). When I go back, I’ll be adding this to my itinerary and it seems the pass is worthwhile. Thanks Alice. We never seem to have enough time no matter how often we go back. I’d like to stay overnight in Hakone and try one of the local onsen some time too. We were in Japan earlier this year but didn’t make it to Hakone. I wish we could have now that I read this, though! It sounds like a fantastic day trip. The cable cars look like a lot of fun, especially if you have good views of Mt. Fuji! The pass would be nice for the savings, but even more so to skip the lines! Thanks for sharing! We’ve been surprised that Japan isn’t nearly as expensive to travel as we’d expected. I think if you want to do English speaking tours the price goes up substantially but we prefer to do our own thing anyway. I’ve not visited Japan before, but I’ve heard it can be quite expensive. Any amount of savings helps! Thanks for posting. Thanks Mags, Japan is definitely one of the more expensive parts of Asia to travel but we don’t find it more costly than it is in most western countries and there are lots of ways to stretch your travel dollars there. Thanks Mar. When we’re travelling convenience (and any saving) are appreciated to help squeeze more into the time and travel budget. It’s always good to know about money saving tips, especially in places like Japan where transport can be expensive! It’s interesting to know this type of thing exists. Thanks for this thorough and honest review! I’ve been to Hakone and it was a highlight of my first trip to Japan. Nice to see that it’s accessible in winter and that there’s a pass to make the journey easier. We were traveling with Japanese friends who were over-the-top gracious. Not sure I could’ve done it on my own. It would be fantastic to travel Japan with local friends, we travel independently and I’m sure there is so much more depth you would learn about the history and culture from someone you knew well. I don’t have any current plans to visit Japan, but I can sure appreciate the thought and detail that went into researching which pass made the most sense for your travels. I’m sure the information will be very helpful to Tokyo visitors! Thanks Tami, it really is an incredible country to visit we can’t recommend it enough!